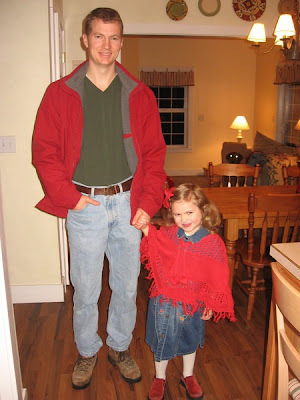 For several years now, Madeline and Lyle have planned daddy/daughter dates. They don't happen often, maybe a couple of times a year, but when Abby got wind of it, she knew she wanted a special dad night too. They got it put on the calendar, and on Friday they had their first date. Abby was SO excited! She had me get her looking cute and then wanted Lyle to come knock on her bedroom door. She waited and waited for him to come upstairs. Finally, she said on the intercom, "Have I been stood up?!" Lyle arrived and promised me he wouldn't keep her out too late. They went out to dinner at Red Robin, where Lyle said that got lots of smiles and "oh how cute," types of comments. Afterward, they went to a movie and then came home. Abby was sad that her date was finished and wanted Lyle to do a "sleepover". Lyle politely declined. Let's hope that by age 16 she can end her dates at the door!